Home / Unlabelled / Lady Reveals How She Was Almost Killed By Lipton Tea That it's Expiry Date Has Been Tempered With. Lady Reveals How She Was Almost Killed By Lipton Tea That it's Expiry Date Has Been Tempered With. 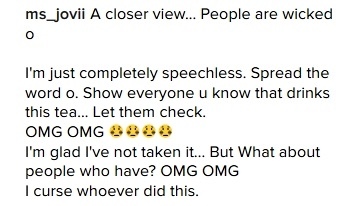 According to the shocking Instagram post, the user who bought the product tried to open the pack of tea at home and noticed a suspicious looking cellotape around the edges of the box. When she tore it open, she looked closely and saw that the factory expiry date on the box had been covered with a fake sticker that was created by the shop owner.